Have you ever read a book, and enjoyed it so much, you don't know how to express your love for it properly? 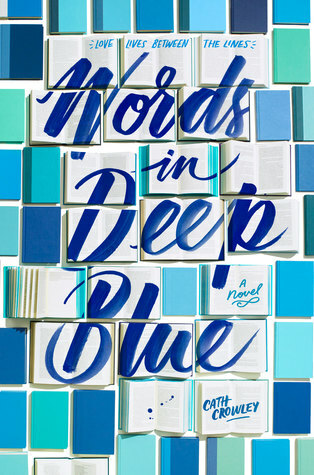 I fell head-over-heels for Words in Deep Blue from the first page but I have no idea how I am going to share that love in a review! I literally clutched my tablet (I got a digital advanced copy) to my chest when I finished, I loved it that much. My first words after reading it were, "This book is important to me." I can't explain fully why this book touched me so, but I shall surely try my best. First and foremost, this is a book about words. Words are a character within the pages of this story and it is through words that the characters connect, explore, love, and live. Words are cherished and celebrated. Cath Crowley has made me fall in love with the love of words. Then there's the main characters, Rachel and Henry. I love them. I love them both so very much. Henry is happy living above and working in the secondhand bookstore his family has owned his whole life. I don't think it's a stretch to say Howling Books is his happy place. He loves Howling Books, his family, his girlfriend and friends, poetry, reading, and dreaming about a long and happy life within the walls of the store. Then his best friend moves away without saying goodbye, and a few years later his girlfriend dumps him, his mother moves out, and the future of Howling Books is in jeopardy. Rachel and Henry used to be best friends. In fact, Rachel was in love with Henry. She tried to tell him by writing a letter to him and placing it in the page of his favorite poem within the Letter Library at Howling Books, but he never responded. She was hurt and confused and felt ditched by her best friend who seemed to prefer to spend the "last night on Earth" with another girl. Her family moved out of the city and Rachel was never able to get any closure on her lifelong love for Henry. Then, sadly, her brother drowns in a freak accident. She and her mother are devastated and can't seem to find joy in anything. They're lost at sea without an anchor, as the saying goes. As a last desperate move, Rachel is sent back to the city to live with her Aunt, to work and hopefully begin to live again. Unfortunately, her Aunt gets her a job in the last place she wants to be. Both Rachel and Henry are breathtakingly real, which I attribute to the tremendous talent of Cath Crowley. Every setback, every heartache, every triumph resonated with me to my core, leaving me sad that I had to say goodbye after reading the last word. Even the supporting characters were so real to me, I felt like I knew them all. Henry's dad is desperately trying to fix his marriage with the woman he loves. Henry's sister, George, is tough to get to know, but she's truly independent, loving, and smart. Throughout the book, we even get to meet Rachel's brother, Cal, through flashbacks and memories. Every single character breathes! I found myself constantly hoping that Rachel and Henry could mend the rift between them. That Rachel could finally move through at least some of the grief she suffers from losing her brother. That Henry could finally get over Amy, a girl who most definitely does not deserve him. That everything would work out well for them and those they love. I needed everything to work out for these souls with whom I felt sincerely deserved a happy ending. By far, one of my favorite parts of Words in Deep Blue was the idea of the Letter Library. Within the walls of Howling Books, there is a section of books not for sale where people can leave letters, drawings, and notes written on/between the pages. It is in this area, with the words shared within pages of books, that we learn about life and love and heartache and the wonderful characters. I admit, at first, I cringed when I read there was a section of the bookstore where people wrote on books. My inner bookworm wanted to cry for all the books I thought were being defiled. Then I began to truly fall in love with the idea of a collection of books where people can leave their mark and communicate with others. It's such a stunning and poignant and real thing. If ever I am able to own my own used bookstore, you can bet I will be including a Letter Library. As I have mentioned before, it is difficult for me to adequately express and discuss why this novel is so important to me. My thoughts and feelings are all over the place, and that was with me waiting a month before finally writing them down! I think the best I can do at the moment is simply state that Words in Deep Blue has my heart. Read it. Read it as soon as possible.